The best birthday to celebrate besides your own is without a doubt the Queen’s. A couple of very nice parties will be served to you in honour of Her Majesty. I wonder if she’d like them, but that’s pretty irrelevant. This is the last year we get to party with her, so I highly recommend you to go boozin’ at the following night parties in Amsterdam. God bless the Queen! On this night, we start celebrating Beatrix’s last birthday party. Therefore Rotzooii believes it’s time for an appropriate farewell. Of our Queen, but also of their beloved event, traditionally held in the areas of the WesterUnie. With an audience fully dressed in black, they call this a tribute to the Queen and to the visitors of ROTZOOII over the past years. The combination of (international) artists like Karotte, Steve Bug, Kenny Larkin, Andre Butano, Daniel Sanchez and Olivier Weiter, amongst others, an indescribable light show and a wonderful sound system, are their ingredients for a memorable evening. The guys from Pleinvrees aren’t exactly modest: “The Netherlands is partly dependent on German export, but the German economy is totally dependent on Pleinvrees.” For Queen’s Night they proudly import six German acts, as if they were black Mercedes vehicles. For this occasion, the Undercurrent will be located somewhere else than you’re used too, just ten minutes away from Central Station. The line-up consists of Alle Farben (DE), Oliver Schories (DE), Peer Kusiv LIVE (DE), Dirty Doering (DE), Boss Axis (DE), Hannes Fischer (DE), Robin Schulz LIVE (DE), Illesnoise, Rachelle Grooten and Shimmer. Once again, these ‘lasercats’ take over AIR. As I’ve said before, unicorns and cats are the most important thing on the planet right now besides triangles. The people who brought you Koekoek continue to expand their empire with a special somethin’ somethin’ for Queen’s Night, featuring Subb-an, Tube & Berger, Mario Basanov, John Monkman, Bakermat and many more deep house heroes. 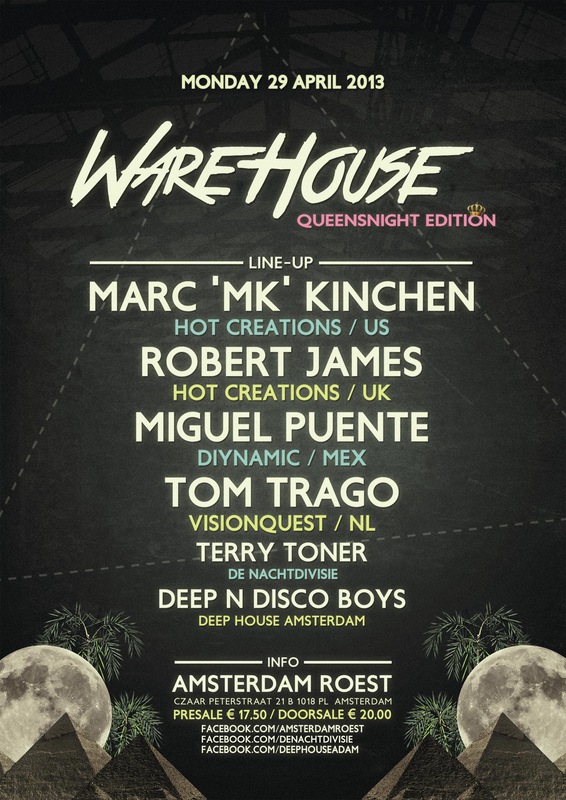 De Nachtdivisie, Amsterdam Roest and Deep House Amsterdam joined forces to throw a genuine warehouse party in honour of the Queen. On Monday, Roest takes you back to that original warehouse vibe, with a strong line-up of both international and local heroes; Marc ‘MK’ Kinchen, Robert James, Tom Trago, Voyage Direct, Miguel Puente, Terry Toner and Deep ‘n Disco Boys. I heard there’ll be an extra phat sound system awaiting you for this royal evening to complete that true warehouse atmosphere. Pre-sale is sold out, but 250 tickets will be available at the door. Prepare for a massive hangover on Queen’s Day.